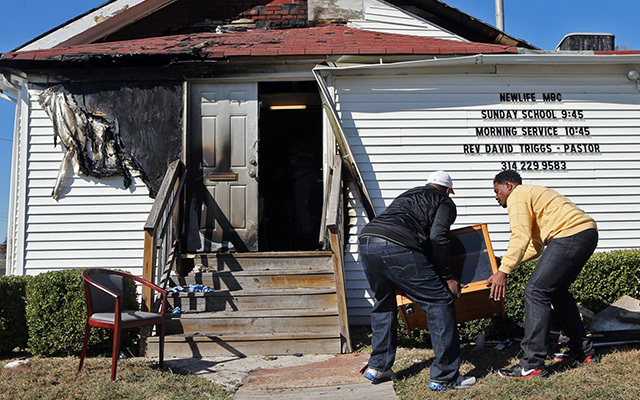 A spate of arsons this month at six predominately black churches in the St. Louis area has raised concerns that these incidents could be racially motivated. But they are by no means the first arsons at places of worship this year. As of July 14, the Bureau of Alcohol, Tobacco, Firearms and Explosives (ATF) had ruled 29 of 79 fires at houses of worship in 2015 to be arson, although some investigations were ongoing. Indeed, about half of all the fires at houses of worship in the past 20 years were intentionally set, according to a Pew Research Center analysis of data from the ATF. Of the 4,705 reported fire incidents at houses of worship between 1996 and 2015, 2,378, or 51%, had been ruled intentional as of July. While the share of church fires caused by arson has remained relatively stable over the years, the number of intentional church fires (including both arson and bombing incidents) has been dropping, as have church fires overall. Between 1996 and 2000, an average of 191 intentional fires were reported each year, accounting for 52% of all church fires. That average dropped to 74 intentional fires per year between 2010 and 2014, or 48% of all church fires. Fires caused by arson are far more common at houses of worship than in most other kinds of structures. For instance, in 2013, only about 10% of all nonresidential fires and 5% of residential fires were intentionally set, according to the Federal Emergency Management Agency. Church arson was common during the civil rights movement, with sometimes devastating consequences. In 1963, for instance, four young girls were killed at the 16th Street Baptist Church in Birmingham, Ala., after members of the Ku Klux Klan planted dynamite beneath the front steps of the church. Congress was prompted to take action when church arsons began to increase in the 1990s. A House Judiciary Committee report from 1996 found that an outsize percentage of church arsons were at black churches in the South. In 1996, President Bill Clinton signed into law the Church Arson Prevention Act and established the National Church Arson Task Force in response to concerns about the increased “incidence of arson at places of religious worship,” especially those that serve predominantly black congregants. Since the law was enacted, ATF has been charged with investigating the origin of all reported fires at houses of worship and classifying them into one of several categories: accidental, bombing, incendiary (i.e. arson), undetermined or other (attempted arson, hoaxes and threats). Note: This post was originally published on July 24 and updated on Oct. 26.